Be the first to share your favorite memory, photo or story of Germaine. This memorial page is dedicated for family, friends and future generations to celebrate the life of their loved one. 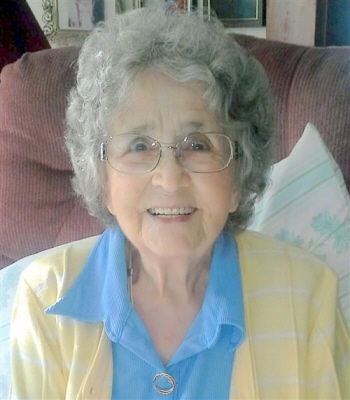 Mrs. Germaine C. Laroche, age 99, passed away Wednesday, April 3, 2019 at the St. Albans Health and Rehab Center. She was born on January 14, 1920, in Swanton, daughter of the late Jules and Rose Emma (Bessette) Gagne. She attended school in Highgate Falls. On February 22, 1943 she married Laurent Laroche of Highgate. She was a homemaker and mother. Before she was married, she played guitar and sang in a band with her brother Paul. She also enjoyed the outdoors and planting flowers with her husband. She planted beautiful vegetable and fruit gardens. She was also a seamstress and made crafts and quilts. She also enjoyed cooking and baking and loved anyone that would come over for meals. In the 1960’s and 1970’s she was employed in the Dietary Department at Kerb’s Hospital. Germaine is survived by her four children, Julian Laroche and his fiancé June White of St. Albans, Pauline Parent and her fiancé Douglas Corwell of Sheldon, Ernest Laroche and his wife Lori of Swanton, and Diane Laroche of St. Albans. She had 10 grandchildren, 19 great-grandchildren, and one great-great-grandson. She was predeceased by one child, 2 grandsons, and is the last survivor of 17 brothers and sisters. The Liturgy of Christian Burial will be celebrated Tuesday, April 9, 2019 at 10:00 AM in Holy Angels Roman Catholic Church. Interment will follow in the Laroche family lot in St. Louis Cemetery. The family will receive condolences Monday evening, April 8, 2019 from 4:00 PM until 7:00 PM in the Brady & Levesque Funeral Home, 86 South Main Street, St. Albans. As an alternative to flowers, memorials may be sent to the Franklin County Area Cancer Network, PO Box 1186, St. Albans, VT 05478. Arrangements are entrusted to the Brady & Levesque Funeral Home, where online condolences and memories may be shared with her family and friends at: www.bradyandlevesque.com. To plant a tree in memory of Germaine C Laroche, please visit our Tribute Store. "Email Address" would like to share the life celebration of Germaine C Laroche. Click on the "link" to go to share a favorite memory or leave a condolence message for the family.